After expanding from a 5g to two 10gs in a little over a month, we have workable plans for both, finally. It took sacrificing a metro-style shelving unit, moving more than a few pieces of furniture and a fair amount of equipment to achieve the goal. 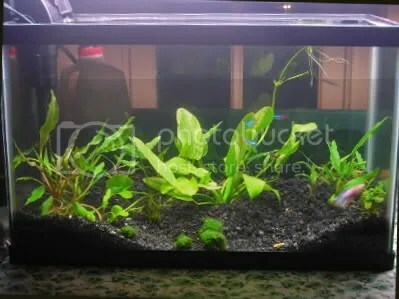 Now there is one 10g with a view straight out the window; one as a grow-out and shrimparium. The lights are so bright, we all need shades! Realistically a skirt needs to be fabricated for the apron of the shop-light. Sitting level relative to the lights is a little uncomfortable. 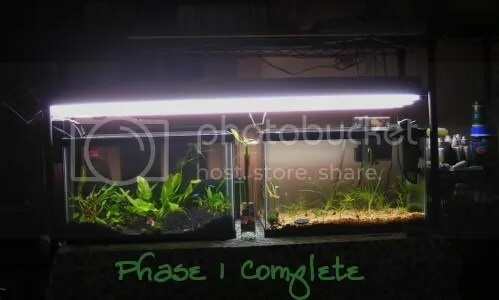 Finally, a workable aqua-scape foundation.
. . . And on to the 10g:redux tank . . . In addition to being the grow-out, this tank is now the official Shrimparium. Of the original party-of-five, two hearty survivors live here along with six of the second party of eight. 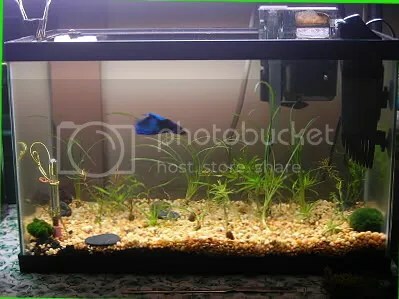 The male Betta Splendens was given this tank due to his placid nature. He will not bother the shrimp, except to nose them out of the way, occasionally. The AqAdvisor, reviewed on Monday, November 23, 2009 was invaluable in making the phase I decisions. Projections for Phase I.5: Purchase another filter, so the 5g can be redone as well. Stocking plans for the 5g are up in the air, currently. Projections for Phase II: fabrication of some trial grow-tubes I saw on Sy West’s YouTube page. If you are interested in his rig, here is his link.